The Readmissions Penalty at Year Three: How Are We Doing? A few months ago, the Centers for Medicare and Medicaid Services (CMS) put out its latest year of data on the Hospital Readmissions Reduction Program (HRRP). As a quick refresher – HRRP is the program within the Affordable Care Act (ACA) that penalizes hospitals for higher than expected readmission rates. We are now three years into the program and I thought a quick summary of where we are might be in order. HRRP penalties began 3 years ago by focusing on three medical conditions: acute myocardial infarction, congestive heart failure, and pneumonia. Hospitals that had high rates of patients coming back to the hospital after discharge for these three conditions were eligible for penalties. And the penalties in the first year (fiscal year 2013) went disproportionately to safety-net hospitals and academic institutions (note that throughout this blog, when I refer to years of penalties, I mean the fiscal years of payments to which penalties are applied. Fiscal year 2013, the first year of HRRP penalties, refers to the period beginning October 1, 2012 and ending September 30, 2013). Why? Because we know that when it comes to readmissions after medical discharges such as these, major contributors are the severity of the underlying illness and the socioeconomic status of the patient. The readmissions measure tries to adjust for severity, but the risk-adjustment for this measure is not very good. And let’s not even talk about SES. The evidence that SES matters for readmissions is overwhelming – and CMS has somehow become convincedthat if a wayward hospital discriminates by providing lousy care to poor people, SES adjustment would somehow give them a pass. It wouldn’t. As I’ve written before, SES adjustment, if done right, won’t give hospitals credit for providing particularly bad care to poor folks. Instead, it’ll just ensure that we don’t penalize a hospital simply because they care for more poor patients. All of this gets us to year 3 of the HRRP. In year 3, CMS expanded the conditions for which hospitals were being penalized to include COPD as well as surgical readmissions, specifically knee and hip replacements. 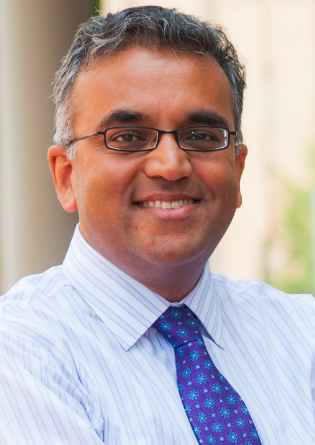 This is an important shift, because the addition of surgical readmissions should be helpful to good hospitals that provide high quality surgical care. Therefore, I would suspect that teaching hospitals, for instance, would do better now that the program also includes surgical readmissions than when the program did not. But, we don’t know. So, with the release of year 3 data on readmissions penalties by individual hospital, we were interested in answering three questions: first, how many hospitals have managed to sustain penalties across all three years? Second, who are the hospitals who have gotten consistently penalized (all three years) versus not? And finally, do the penalties appear to be targeting a different group of hospitals in year 3 (when CMS included surgical readmissions) than they did in year 1 (when CMS just focused on medical conditions)? We began with the CMS data released in October 2014, which lists, for each individual eligible hospital, the penalties it received for each of the three years of the penalty program. We linked these data to several databases that have detailed information about hospital characteristics, including size, teaching status, Disproportionate Share Hospital (DSH) Index – our proxy for safety net status — ownership, region of the country, etc. We ran both bivariate models as well as multivariable models. We show bivariate models because from a policy point of view, that’s the most salient (i.e. who got the penalties versus who didn’t). About 80% of eligible U.S. hospitals received a penalty for fiscal year 2015 and 57% of U.S. hospitals eligible for the penalties were penalized each of the three years. The penalties were not evenly distributed. While 41% of small hospitals received penalties in each of the three years, more than 70% of large hospitals did. There were large variations in likelihood of getting penalized every year based on region: 72% of hospitals in the Northeast versus 27% in the West. Teaching hospitals and safety-net hospitals were far more likely to be penalized consistently, as were the hospitals with the lowest financial margins (Table 1). 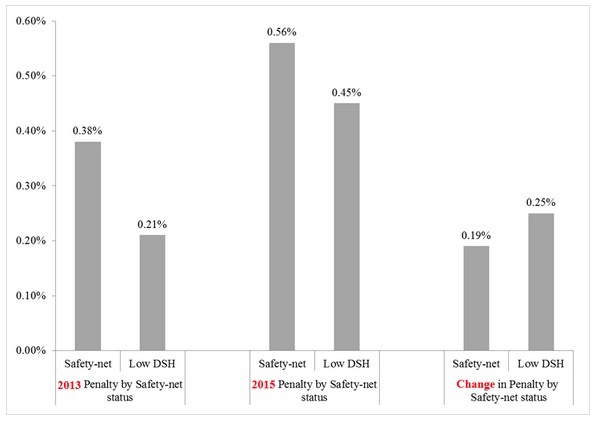 Consistent with our hypothesis, while penalties went up across the board for all hospitals, we found a shift in the relative level of penalties between 2013 (when the HRRP only included medical readmissions) versus 2015 (when the program included both medical and surgical readmissions). This really comes out in the data on major teaching hospitals: In 2013, the average penalty for teaching hospitals was 0.38% (compared to 0.25% for minor teaching or 0.29% for non-teaching). By 2015, that gap is gone: the average penalty for teaching hospitals was 0.44% versus 0.54% for non-teaching hospitals. Teaching hospitals got lower readmission penalties in 2015, presumably because of the addition of the surgical readmission measures, which tend to favor high quality hospitals. In the same way, we see the gap in terms of the penalty level between safety-net hospitals and other institutions narrowed between 2013 and 2015 (Figure). Note that “Safety-net” refers to hospitals in the highest quartile of disproportionate share index, and “Low DSH” refers to hospitals in the lowest quartile of disproportionate share index. Hi, I like what you’ve done here. I think it may be interesting to ponder how many observation units these teaching hospitals have. We know that observation units, for some conditions, 1) decrease the LOS, costs and more obviously, 2) don’t count towards readmissions. We’ve published data showing that there are more observation units in urban and academic settings. Do you think that could be a piece of the puzzle in determining the source of the improvement? Great hypothesis and that is possible. My suspicion is that it is the way the penalties are shifting towards more surgical conditions. But, that said, agree with the idea that observation stays are part of the explanation (though my sense from the data is that its only a modest part). Just a thought experiment: If an acute care hospital were physically in the same building and owned its own SNF, to which it always referred its discharges, would not it be medically good to have lots of discharges and readmissions? The hospital would then be essentially testing or pinging the SNF by discharging patients early to see how they would do in that less intense environment. Back and forth they would go and there would be no aspersion cast on readmission at all. Interesting. The word “billing” comes to mind. What? You want to think about what would be optimal for patient care? That seems a little radical to me 🙂 Yes, I agree that something like that, where you hand off care from acute to rehab to test out whether the patient is read (with quick, seemless pickup if the patient isn’t) would be ideal. Would shorten LOS, improve functional status, and almost surely leave patients much worse off. But, as Bobby says below, the word “billing” does come to mind and makes this notion untenable in current environment. Maybe we’ll finally make some headway. It was a priority QIO issue every time I worked there. Great question. We haven’t looked but we could. My gut says no — that the reductions are not coming from a lot of the changes that hospitals are making within their walls — but instead from what they are doing after the patient leaves. But, that’s a data-free conjecture on my part. Thanks for sharing that Bobby. Exactly what i was looking for.